Gigi loves young people, and has spent her adult life working with students of all ages. She received a Bachelor’s degree in Choral Music Education from Georgia Southern University, and a Master of Divinity from Mercer University’s McAfee School of Theology. It was there that she met her husband, Rory. 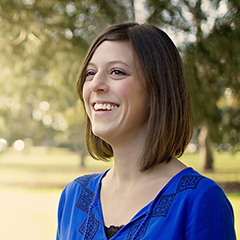 Before moving to Tennessee, Gigi worked in a wide range of ministry settings. She has served as Chaplain of a Children’s Home for kids with special needs, Minister of Children and Youth, and Interim Music Minister. She has also worked as an elementary school teacher, Director of a children’s community choir, and private voice and piano teacher. Rory and Gigi have filled their life together with ministry, board games, volleyball, and two sweet little girls. Gigi enjoys cooking, sewing, and dabbling in organic gardening. She’s a Georgia girl born and raised, but loves living in Oak Ridge!